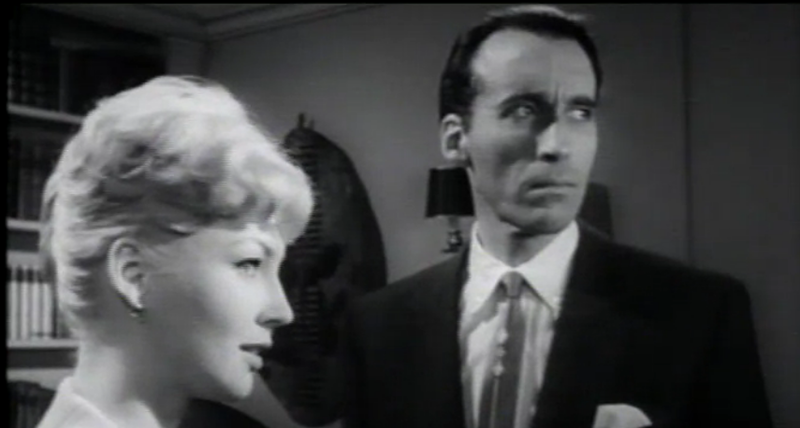 The City of the Dead (U.S. title: Horror Hotel) is a 1960 horror film directed by John Llewellyn Moxey and starring Christopher Lee, Venetia Stevenson, Betta St. John, Patricia Jessel and Valentine Dyall. Produced in England but set in America, the British actors were required to speak with American accents throughout. This opening story is in reality a dramatization of the lecture on witchcraft Professor Alan Driscoll is giving to his history students at university. One of his students, Nan Barlow, is particularly interested in this subject, so the professor advises her to visit Whitewood, where she can find many interesting things on the topic. Nan goes there on vacation. Having settled in The Raven’s Inn, a hotel owned by eccentric Mrs. Newless, Nan begins to study the history of the town. She gets acquainted with the only normal-seeming local resident, Patricia, and upon borrowing a book on witchcraft from her, soon learns that the very night she is there–February 1st–is also Candlemas Eve–the day when the witches sacrifice a young girl. Nan is eventually lured down to the basement of the hotel, which is actually a satanic shrine, and gets captured by Mrs. Newless and members of her coven. Newless says that she is actually the immortal Elizabeth Selwyn. To sustain her immortality, virgins must be sacrificed to the witch every year—and this year, the student is the chosen victim. Two weeks later, having not heard from Nan, her brother Richard is persuaded to check up on her by her fiance Tom, and discovers that not only does Whitewood not exist in any phone directory, but when the police are summoned to join the search, that Nan abruptly left The Raven’s Inn without informing anyone. After Patricia herself travels to Nan’s school to meet Professor Driscoll, inquiring where she could find Nan’s family, she visits Richard and Tom and shares her concerns with them. Richard then travels to Whitewood himself, encountering the formidable Mrs. Newless and reconnecting with Patricia. Tom must overcome witches’ machinations on the way when he takes off after Richard(car crash), and the mystery deepens when Nan appears to have vanished without a trace. Richard meets the Reverend Russell, Patricia’s grandfather, who tells him about the demonic cult ruling over the town. Soon, Patricia is kidnapped, and Richard finds her in the same basement where Nan died. The girl is ready to be sacrificed. To his great surprise, Richard learns that the leader of the satanic sect is Mrs. Newless/Elizabeth Selwyn and that Professor Driscoll is himself a centuries-old member of the coven, who deliberately sent Nan to her death. Richard is also captured and is soon to be killed. At the last minute, the greatly-injured Tom gets involved and, with the help of the cross, burns the witches, although he himself is killed with a knife in the back. Newless escapes, but she is dying as the time of sacrifice is missed. Later, Richard and Patricia find her burnt body in the hotel.